The announcement may be scheduled for IFA 2012 tomorrow but there's still time for a few last-minute Samsung Galaxy Note 2 rumours, including news of its colour variants. It may not be the most technologically exciting development in the history of Note 2 rumours, but we're hearing that the phone-sized tablet will come in both Ceramic White and a mystery second colour. Yes, gird your loins, lock up your daughters, crack out the bubbly; you'll be able to get the Note 2 in the thrilling shades of white or TBC, according to one retailer's inventory list. Our money's on black. Supersonic Night Fury Black. In other exciting phone colour news, the leak also suggests that the Samsung Galaxy S3 will also be getting a new shade: Titan Grey. 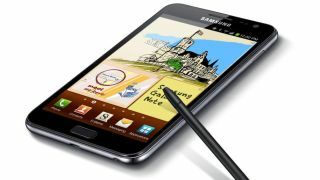 As well as the colour-chat, the leaked inventory also suggests that the Samsung Galaxy Note 2 release date will fall in the week October 1 - 7. Colouring aside, we're pretty excited about the Note 2; a Korean newspaper just 'confirmed' that it will come with Jelly Bean (Android 4.1) and an excellently large 5.5-inch screen. That's even bigger than the original Note, which came with a 5.3-inch display – we're sure those 0.2-inches will make all the difference. TechRadar will be front and centre at the Samsung Galaxy Note 2 launch event at IFA 2012 – it all kicks off tomorrow so stay tuned. In the meantime, you've got a big decision to make: white or not-white?